A Golden Globe Award winner for Best Picture, Toy Story 2 has become a favorite all across the world, garnering praise from fans and critics everywhere. It's "an instant classic," raves New York Magazine. Now in a 2-disc collector's edition with a sparkling new picture and spectacular home theater mix, this groundbreaking animated adventure is even better! While Andy is away at summer camp, Woody is toynapped by AI, a greedy collector who needs Andy's favorite toy to complete his Roundup Gang collection. Together with Jessie, Bullseye and the Prospector, Woody is on his way to a museum where he'll spend the rest of his life behind glass. It's up to Buzz, Mr. Potato Head, Hamm, Rex and Slinky Dog to rescue their friend and remind him what being a toy is all about. After 'A Bugs Life' was received rather lukewarmly at the box office, Pixar was under pressure to make their next movie a hit. With early test scenes for a direct-to-video follow-up to 'Toy Story' turning out so well, plans were quickly hammered to rework the film for theatrical release. For many fans, revisiting the toy chest so soon seemed like a risky gamble, but to our surprise, it wasn't at all. As the film opens, Woody is faced with the inevitable fact that Andy will one day grow up and outgrow playing with toys. Should Woody sacrifice the few remaining years of playing with Andy, for a lifetime spent looking out through through protective glass in a museum for collectible toys (It seems Buzz wasn't the only one with a highly popular TV show and action figure tie-ins.)? This is a legitimate concern for a toy. We feel for Woody. This is the first time real, true drama and sadness is injected into a Pixar film, paving the way for the emotional openings of 'Up' and 'Wall•E.' 'Toy Story 2' set the bar high, not only on a technical level for a CG cartoon, but on an emotional plane that could affect both parents and children. We knew that 'Toy Story 2' was going to introduce some new characters. It's standard operating procedure for sequels to do so, but nstead of throwing in a few new characters just for additional merchandising opportunities, the new characters of Jessie, Stinky Pete, and Bullseye have a lot of thought put into them without sacrificing sufficient screen time from the characters we had come to know and love. Storytelling isn't the only area in which 'Toy Story 2' excelled. It had already been four years since the release of 'Toy Story,' yet Pixar's animation techniques already showed improvement by leaps and bounds. As I said in my review of the original film, some of the animation in 'Toy Story' isn't aging well. In particular, Sid's dog looks especially bad compared to the dogs in 'Up,' but that's okay, they were still working to perfect their craft. Here we can see the evolution that Pixar was going through. Andy's new dog looks much better than Scud, and the human faces are beginning to take on a more lifelike appearance. Featuring updated techniques, 'Toy Story 2' is a demo material, just like 'Toy Story,' but with the added value of slightly better animation. Like 'Toy Story's video presentation, the colors pop right off the screen. Primaries are bright and vibrant. The greens of Buzz's suit and Rex's body, reds of Jessie's hat and hair, the blues of the sky and Woody's pants are all perfectly rendered and exciting to look at. Edges are exact, and fine detail is crystal clear. From the texture of Al's cheeto dust-covered fingers, to the intricate stitching of Woody's vest, no detail is too fine. Care is taken to make the toys look worn and played with. Smudges of dirt and streaks of black occasionally speckle each character with a sort of chaotic precision. There are no blemishes or artifacts to speak of. This is a perfect video presentation, plain and simple. Demo, demo, demo! If it's possible, this DTS-HD Master Audio 5.1 accompanying 'Toy Story 2' is even more of a sonic delight than that on the 'Toy Story' Blu-ray. The LFE kicks right in during the prologue as Buzz blasts through the air. The rumbling from the subwoofer is perfectly prioritized with the other sound effects and dialogue happening as to never drown those out. Panning effects are smooth and without hesitation. Dialogue is perfectly clear through the center channels. The surround channels are alive with all types of clear, engulfing ambient sounds. When Woody falls through the pile of cards during his dream, the cards click and clack around the room with care. The soundtrack is given ample room to flourish. Suffice to say, this is another demo quality audio presentation from Pixar. 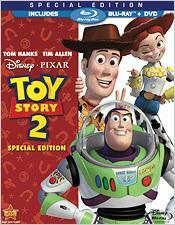 Making Toy Story 2 (SD, 8 minutes): The standard making-of featurette that was ported over from the original DVD. Nothing too fancy here, but there is some great behind-the-scenes footage. John Lasseter Profile (SD, 3 minutes): A brief profile on how Lasseter tries to emulate the imagination and perseverance of Walt Disney in encouraging his team of Pixar artists and writers to continually push themselves to new heights. Cast of Characters (SD, 4 minutes): A quick guide of the 'Toy Story' characters old and new. Toy Box (SD, 14 minutes): Contains quite a few funny little nuggets. "Outtakes" allows you to watch the hilarious staged outtakes that ran during the credits of the film. "Jessie's Gag" is a amusing easter egg from the DVD release. In "Who's the Coolest Toy?" Tom Hanks and Tim Allen argue about whether Woody or Buzz is the coolest toy. Other features here include "Riders in the Sky Music Medley," and "Autographed Pictures. Deleted Scenes (SD, 4 minutes): Three scenes are included here. They're all unfinished animation. "Deleted Animation Intro," "Crossing the Road," and "Godzilla Rex." Design (SD, 27 minutes): This is the same type of stuff that can be seen in the design portion on the 'Toy Story' Blu-ray, and would have been greatly improved with a high definition upgrade. Production (SD, 14 minutes): "Designing Woody's Past, "Making Woody's Roundup, "Production Tour," "Early Animation Tests," "International Scene," and "Special Effects." "Desiging Woody's Past," and "Making Woody's Roundup" are the two most interesting featurettes included here. They give an idea of the work it took to create a believable past for Woody, which is why the movie works in the first place. Music & Sound (SD, 14 minutes): "Designing Sound," "Making the Songs," "Woody's Roundup Music Video," and "Jessie's Song." Yup, another music video, in case you were worried you might not get one this time around. 'Toy Story 2' represented a pivotal turning point for Pixar. We all know how successfully it turned out. This is a must own movie, one that we highly recommend adding to your Blu-ray collection, along with the first 'Toy Story.' Together they comprise a dynamic duo of computer animated demo material, one that will delight you and your guests for years to come. 1080p is truly the home for material like the 'Toy Story' franchise.